For years I have said to my dining partners “If you want lamb, make reservations.” I am not a huge lamb fan. I usually had it at wine dinners, restaurants, and even in Scotland. But it was not something that I ever cooked or prepared. Having lamb paired with the appropriate wine is, like most food, amazing. Other than that, it’s just not on my radar. Then one afternoon I was out wine shopping. I just happened to get an outstanding bottle of wine at a bargain price. Red wine. And it was begging to be paired with lamb. So the adventure began. Never having cooked lamb before, I had some homework to do. Finding a good butcher for top of the line lamb chops was a must. I found a local mediterranean market, and lucky me…they had a butcher. Not only did they have fresh lamb, they cut the chops to order. Score! I decided to cook the chops outside on the grill. Like steak, I learned that lamb is delicious grilled.I also discovered that rosemary was perfect to flavor the chops. I have a friend that grows rosemary in her yard in abundance, so I zipped over there and nabbed a handful! I wanted to keep it simple. 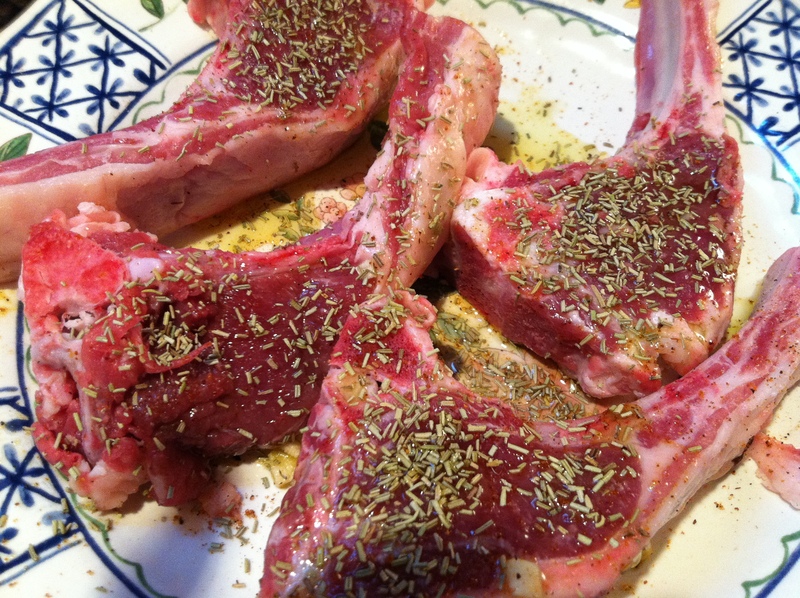 Rosemary, salt, pepper, and some flavorful high quality olive oil is what I used to prepare the chops. I started by letting the chops sit for a couple of minutes to come to room temperature, then I rubbed them with olive oil and sprinkled on the rosemary. Salt and pepper too. I placed the chops on a hot grill at about 400 degrees. A quick flip after 4 minutes, and in another 4 minutes they were done. I pulled them off the grill, put a pat of butter on each chop, and tented them with tin foil. Meat is at its best after resting for a few minutes. After letting the wine breath a bit, it was poured and the lamb plated. Roasted asparagus accompanied the chops, as did wild rice. The bold full bodied wine paired with the meal was a show stopper. Yum! The outcome was incredible! The chops were savory, the wine delish! It was a meal to enjoy at a leisurely pace to fully enjoy the food, wine, and dinner companions. The outcome of my adventure into cooking lamb was a success. The discovery of a new mediterranean market which I will now frequent was an added bonus. And exploring the savory taste sensation of well paired food and wine is always a win in my book! Want dinner in a snap? I think it is possible to put a healthy dinner on the table in less time than going to the drive thru. Yes, a healthy dinner can be on the table in about half an hour. With planning. Sure it takes planning. But that can be done while standing in line, waiting for a dentist appointment, or waking up with that morning cup of coffee. It can be as simple as jotting down notes. I use my smart phone to make my grocery list, and that advance planning helps me get through the store in a snap. Sometimes planning is just a simple trip to the freezer to pull something out in the morning to cook in the evening. 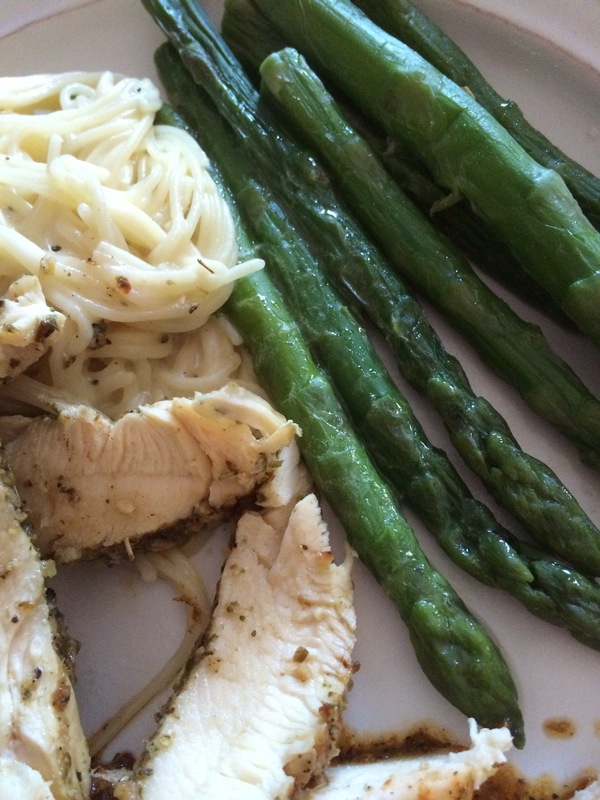 Let me tell you how simple planning helped me with a healthy home cooked meal last week. In the morning, I pulled some chicken out of the freezer and popped in the fridge. By the time I came home from work, the chicken was thawed. I fired up the grill, lightly seasoned the chicken, ans tossed it on the grill to cook. The chicken breasts were thinly cut, so I knew they would cook quickly. In the meantime, I put a pot of water on the stove for some pasta. Angel hair pasta cooks quickly, so I pulled that from the pantry. It would be perfect with the leftover pasta sauce in the fridge I took some frozen asparagus from the freezer, and thought it would round out dinner nicely. The pasta cooked in about 5 minutes. I also tossed frozen peas (I warmed them with the sauce) into the pasta for a little color. The chicken was done in about 20 minutes. I let it rest for a few minutes, then sliced the breasts thin. (Culinary side note: meat is more tender when allowed to rest. I time my proteins to be done 10 minutes before everything else. I then drizzle olive oil over the meat, cover with foil, and let rest). The asparagus went into the microwave. With a little planning, I had a healthy dinner on the table on a weeknight in about 30 minutes. what can you make with little time on a weeknight? Dinner in a snap. Grilled chicken, angel hair pasta with cheese pea sauce, and asparagus. YUM!